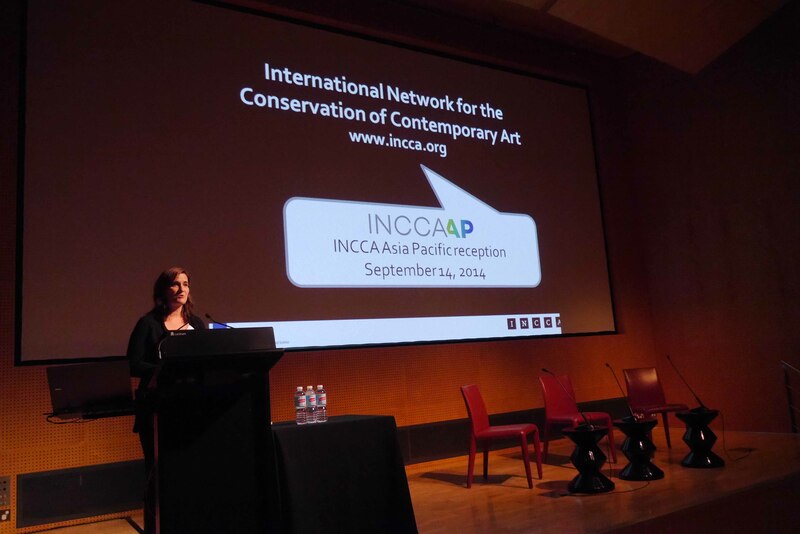 On 14th September 2014, the new regional group International Network for the Conservation of Contemporary Art – Asia Pacific (INCCA-AP) was launched in Melbourne. Karen te Brake-Baldock, INCCA coordinator, attended the launch and provided us with a brief introduction to INCCA, which was established in 1999 to share and preserve the knowledge needed for the conservation of contemporary art. The history of conservation culture as a professional discipline in the Asia Pacific is short in comparison to Europe and the United States. INCCA Asia Pacific’s intended role and function in the emerging field of the care for contemporary art is to investigate specific issues and challenges of the region. This includes issues of climate; material culture; availability of materials for creative and conservation practice; documentation; fusion creation – which combines traditional and contemporary art practices; conservation awareness; and education and training opportunities. INCCA-AP is not only for conservators, but also for art practitioners at large. We acknowledge that these working relationships may differ from region to region and are what contemporary art care is built on. We strongly encourage conservators to join INCCA as members if you have not yet done so and for all who are interested to know the progressions of the field in the Asia Pacific to subscribe to INCCA-AP for updates. Our plans for this group revolve around developing a strong network of practice related professionals. We would like to draw in conservators and non-conservators to share this dialogue. Our initial aim is to identify contacts in the region and to promote the work that is already happening. We hope to get people engaged and talking about issues of caring for contemporary art. To enable this network, we have the website up and running and are currently building a database of subscribers. We have no password protected background in our website, so for members to contact each other directly, they would have to also become members of INCCA where personal contacts can be shared. INCCA-AP can mediate requests from members to meet others, and can also facilitate discussions on Facebook and LinkedIn. We are hoping from this engagement and participation from members that priorities for future actions will be revealed. Feedback so far has included the need for existing archives, conservation professionals and not for profits working in the region to be visible and connected to a network. To this aim, we have started to collate ‘Regional Profiles’ on the ‘What’s Happening’ page of the website. As the network grows, we hope in the longer term to work together on identified projects. was opened up to the floor and other INCCA-AP members Sarah Hillary, Sabine Cotte, Bettina Ebert and Selina Halim as well as participants joined in discussion. Bettina is a professional paintings conservator, who is also qualified in art history. She set up the paintings conservation unit for Asiarta Foundation. Her specialist field of knowledge and research is Southeast Asian paintings, particularly art works from Vietnam.